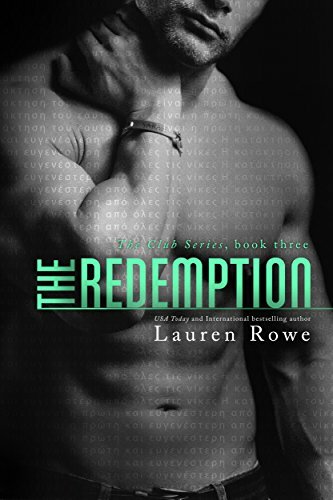 BOOK THREE of The Club Series by USA Today and International bestselling author, Lauren Rowe. In the third heart-racing installment of USA Today, Amazon #1 and International #1 bestselling THE CLUB SERIES, Jonas Faraday continues his quest to overcome his demons. Is he fated for a lifetime of heartbreak and tragedy—or will he finally find his redemption? This is the third of seven books in THE CLUB SERIES, but provides a complete and final ending to this story arc with no cliffhanger. Readers should start the adventure with book 1 of the series (The Club) and read in order. The first four books of THE CLUB SERIES chronicle the epic and exciting love story of Jonas Faraday and Sarah Cruz. Books 5-7 chronicle the story of Josh Faraday (Jonas’ brother) and Kat Morgan (Sarah’s best friend and one of the Morgan siblings). The books of THE CLUB SERIES must be read in order. The books of THE MORGAN BROTHERS BOOKS, a spin-off series of standalones, may be read in any order, even before reading any books of THE CLUB SERIES.